Upskill your staff. Invest in quality. Reap the rewards. You’d be hard pressed to find a training provider with such a strong reputation for delivering quality and world-class customer service as HFE. 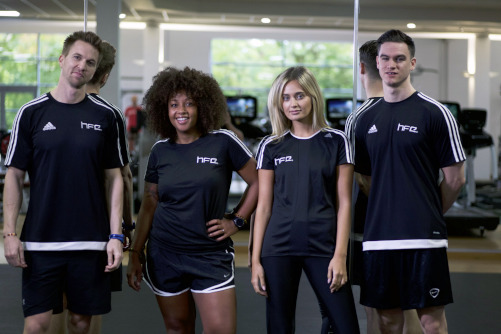 For over 10 years we’ve been shaping the world of corporate fitness by delivering our trademark brand of exceptional training to businesses and organisations throughout the UK. Previously, we’ve worked with emergency services, professional sports clubs, local councils, national gyms and health clubs, the military, schools and colleges, leading charities, and many, many more. It's estimated that staff turnover costs UK businesses a staggering £4bn a year. Losing your best and brightest can have real impacts on productivity and morale, but there is a better way and that's where HFE comes in. It's certainly no secret that businesses who take the time to invest in their staff can reap a wealth of benefits, not to mention avoid the costly pitfalls of recruitment. Our training is tried and tested and we're on hand to help your workforce gain new levels of expertise, increase motivation and ultimately create long-lasting job satisfaction. Any business owner or manager will know that time is precious. There are few organisations that can afford to let even a small amount of staff take lengthy time off for training without it causing a negative impact to productivity or the customer experience. That's why we take a fully bespoke approach, tailoring our training to suit your individual needs. We're incredibly flexible with every aspect of delivery, from the programmes we provide right down to where the training takes place. Minimal disruption and maximum impact guaranteed. It's one thing simply inviting your staff to take part in new training or CPD, but another thing entirely to give them the opportunity to be immersed in a world-class fitness education experience. Whether you have 5 staff or 50, we provide dedicated phone and email support, bespoke print and digital manuals, and access to LES, our innovative online platform that's home to everything from practice tests to video lectures. Depending on your company of choice, it could cost in excess of £5,000 to hire a new employee via a recruitment agency, money that's surely better invested in staff training and improving facilities. CV Connect flips the recruitment model on its head. This game-changing online solution instantly connects qualified professionals with fitness and leisure operators worldwide. There's no red tape, no account management and certainly no recruitment agencies, plus it's entirely free. All you need to do is register your club via the simple and secure sign-up form and connect with the best and qualified talent this industry has to offer. When it comes to the training we've delivered, the results speak for themselves. HFE have been fantastic with our pre and postnatal training. The service from initial contact to support throughout is professional and thorough. We are never left waiting for any information. We will be using their service in the future. We have been very pleased with the service and support provided by HFE throughout. The replies to all of our queries have been very prompt and professional, and you guys worked hard to try to find solutions for our (very specific!) needs. During our research for a training provider we contacted several potential companies and after reviewing them we chose HFE to provide the training for us. We are extremely happy with the competence and quality of the trainers delivering the courses and of all of the resources and the high calibre of the instructors. Truly professional from registration to finish. We completely recommend HFE for their professionalism, knowledge, delivery and commitment to this profession.